The Best & Biggest Cody Simpson Fansite / News, Pictures & More. . . ! “SUMMERTIME” KICK-OFF CONTEST! WIN CODY’S SIGNED BEACH BALL! *Note: This post will always be displayed at the top. New news will be under this post. The staff here at Cody Simpson Web want to help you kick off your “Summertime” and give one of you lucky Simpsonizers a fantastic chance at a prize that you DON’T want to miss! -Make a YouTube video telling people why they should go watch Cody Simpson’s “On My Mind” Music video. -You do NOT have to be IN the video. It can just be a slideshow of pictures & text. Any type of video will do. -Tell where you can go to see the “On My Mind” video. -On Saturday, July 17th, we will pick the top 5 MOST VIEWED videos, so do whatever you can to get people to watch it! -The Top 5 most viewed videos will be featured on a post on the site, and there will be a poll where Simpsonizers can vote on their favorite of the 5 videos. 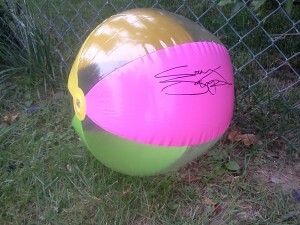 -In this contest you are trying to win THIS beach ball that Cody Simpson signed himself! *Note: The ball was blown with an air compresser. If you have any questions, Tweet me @KorinnaSimone or Lexi @codysimpsonweb. July 26th – Greenville, South Carolina – WFBC Show – More information here.